If you want to feel like a movie star or royal, you should take a look at our collection of rings with emeralds and diamonds. Emeralds offers a striking, glamorous and unique alternative to jewels with colourless diamonds. Would you like an overview of all of our jewellery with coloured gemstones? Take a look at our jewellery with sapphires, rubies and emeralds. Why should I choose a ring with an emerald? A ring set with emeralds was particularly popular in the 1960’s, but is still in demand today. Coloured gemstones in general have been steadily gaining popularity because of their symbolic meanings. An emerald ring is said to bring the wearer love, inspiration and positivity. Which occasion is perfect for a ring with emerald and diamond? If your birthday falls in the month of May, you should be really happy. 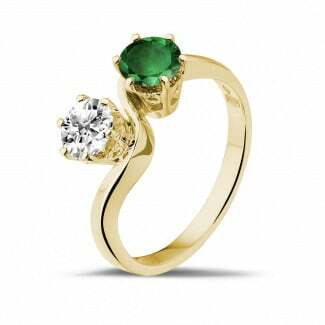 Maybe you will receive a ring with an emerald as a gift from your partner. It would not be surprising, as the emerald is the birth stone for the month of May. Just like the ruby and the diamond, the emerald is associated with a particular wedding anniversary. Depending on the country, it is either the 40th or 55th wedding anniversary which is called the emerald wedding anniversary. Surprise your partner with a beautiful ring with an emerald and diamond on that special day. Do you want to add a touch of romance? 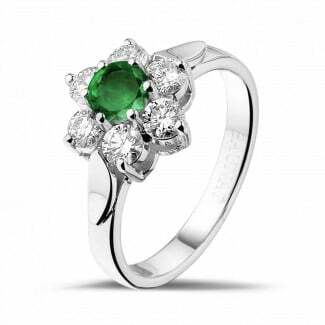 Choose our white gold Toi et Moi ring with emerald and diamond. The two precious stones entwined together become one, just like you and your partner. A wonderful metaphor, right? Did you not find what you are looking for in our beautiful collection? No problem. You can also design and ask us to create a tailor made ring with emeralds and diamonds. Request more information from the BAUNAT experts via mail, telephone or chat.